Promises Kept #1 - Yankee Golden Retriever Rescue, Inc. It has always been the policy of YGRR to allow dogs to stay with us for as long as it takes to find an appropriate home. It is one of the ways in which YGRR is different from many other rescues and shelters. YGRR and its Goldens enjoy this privilege because of our members’ financial support. 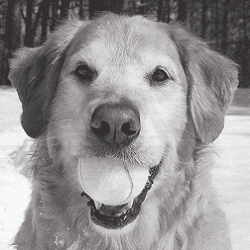 The staff is happy to share the following updates about Rescue Goldens who were featured on our “Looking for Love” page in previous issues of the Golden Times. Jasper and TJ, who were in the Autumn Times, have been adopted. Here is a letter from Rusty, who was in the Summer Times. We want to thank you for finding us the “Right” dog. Rusty fits into our way of life perfectly. We are happy to have him, and we feel he is very happy with us and his new home. You are to be commended for your adoption process. We are completely satisfied with your selection of Rusty for us. It is an ideal match. Rusty is a beautiful dog and we treasure him. He is well behaved (even when he decides to sleep on the sofa). This gentle, loving dog has already paid dividends. He has added a new dimension to our lives and we love him. Our special thanks to Emma, Sue, and Allyson, also the entire staff that took such good care of Rusty. Thank you again for your kindness and we will keep you posted on his progress.